I am just getting back into PCS and MTC after a two year break. I have forgotten so much. It upsets me so much that I have forgotten all of this since I had made so much progress. I know I asked the question in the past that I am about to ask now, but I have searched this forum for it and cannot find it. So here it goes again: I want to import into MTC a template for a popup card that is in the JPG format. The file is attached. I vaguely remember having to use pixel trace to bring in JPG files, but the I also remember something about having to convert to "vector files" (???) before importing to get the cut lines to show up. Anyway, I am not sure how to get the cut lines to be cut lines and the fold lines to be fold lines once I get it into MTC. I am basically just unsure of the whole process now. Can someone give me suggestions? I am hoping that something will jog my memory. I do plan to go back and start from the beginning like I did before in my learning process, but this is driving me crazy. Thanks. @Meow - welcome back! No worries, you do not have to do anything other File => Import and choose the option for Pixel Trace. Now adjust the threshold value and click the button to apply the change until you see that you have all of the bits that you want. Typically for a jpg you can try a setting of around 230. If you go to the max of 250 (or it might be 255) and you get a rectangle shape you went too far. Oh I just looked at your file. It will not make a good cutting file. Where did you get it? It looks like it came from PCS, but you want to find the PCS and get your file as SVG from there. @Liz_A thank you so much. I found the file on pinterest. It is way too low of a quality to make a good cut file. You want SVG versions of files not low quality JPGs. The other option is to manually trace which has been demonstrated during a webinar where andy manually traces a popup of a house I think ? @Crazy_Mr_Zing thank you so much. When you said "manually traced" that jogged my memory. I think he did one sometime in 2016 which was just before I had to quit doing PCS for awhile. @Meow am glad to see you back. I just found a 1/29/2013 webinar where Brian was tracing a manually-cut web file. He is so good at that. 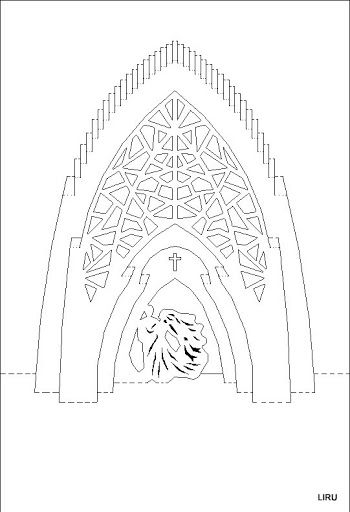 I have done a lot of converting such things by making a copy, adding lines to make a closed file, then using eraser to separate the shapes so I can make my own PCS file. It isn't quick but I end up with a shapes file that way. @Charo thank you. Thank you for the the info on that video. I remember sometime in 2016 Brian imported a complex popup template into MTC and demonstrated how he hand traced it and talked about how he made a popup card from it. I am not sure which recording it was. I wish that there was an index for the 2015-2016 webinars. I do not have PCs with me - but if I Remember right Andy reversed engineered that Popupcard card and you might even find it in the PCs gallery. To reverse engineer, you scan it into MTC, close the shapes so they can be put on different z value (planes) in PCs. I remember Andy's video too. He was drawing lines, curving them this way and that way so fast I could never imagine being able to do that. I gave it a try this morning; got it done but it took hours. I think I should stop looking at hand-drawn popups because I love so many of them and they are HARD. Here is the photo I copied and the files, done the reverse engineered way [email protected] 6111said. @Charo - kudos to you! You have way more patience than I do, LOL! @Charo ; Thank you. 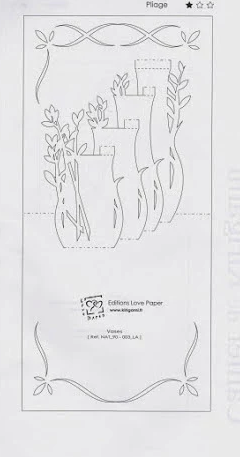 I have looked and looked for that webinar when Andy talked about how he traced a template like you vases. I cannot find it. Thank you so much for sharing those files. I want to learn to hand trace them. I found a cool video on youtube that talks in detail about how to hand trace using the bezier tool in MTC. @Meow - there are likely several webinars where Bryan hand traced items, he was very adept at it as well . Miss seeing both of them work! @Liz_A what happened to Bryan and Andy? I have been off the forums for awhile and I noticed the webinars just stopped in April of 2016. @Meow - Bryan is still in the background managing the Support tickets, and once in awhile we see an answer he has posted. Andy hasn't logged in as himself for over a year. The webinars stopped - this is was a significant monthly cost to Andy, and I know that sales were dropping for MTC and PCS, so understandable why that happened. With no updates and no plugins for new cutters coming on stream, MTC is no longer a first choice product. SCAL is taking it's place in that regard, and is constantly being updated. Sad to say, but sometimes that truth hurts. @Crazy_Mr_Zing ; you always think of such interesting ways to do things. Now I am wondering about your idea of using image software to fill the shapes with black. What kind of image software do you mean? The ability to separate the shapes would certainly help tracing. I have just cleaned some images up a bit enough to cut in MTC but I really miss having the shapes file. So I much prefer getting nice clean images that I can take to PCS and make my own file.